Tonight something possessed me to make a pan of stuffed manicotti. Don’t ask me why, let’s just roll with it. I didn’t write down everything I was doing as I did it, so please bear with me on the directions/proportions. Also it’s after ten at night, I ate dinner less than an hour ago, and I am tired. 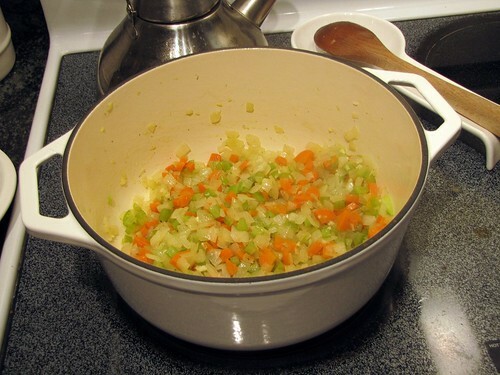 Start the sauce first: Saute the onion, celery, and carrot over medium high heat in olive oil until softened. Season with salt and pepper. Add four of the diced cloves of garlic and saute a few minutes more. Add crushed tomatoes and tomato puree, stir, and bring to a simmer. Add oregano and thyme, and more salt and pepper to taste. 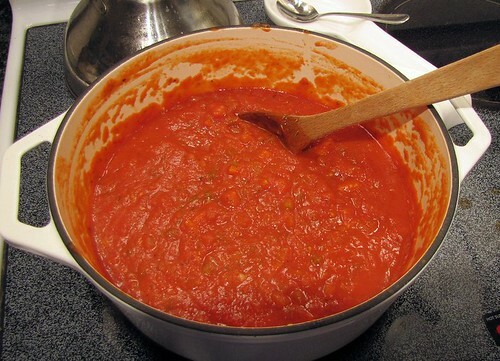 Turn down heat and let sauce simmer, continuing to taste and adjust spices to your liking. You can totally skip this step and use jarred sauce, by the way. It would save you at least a half hour. Heat another pan over medium-high heat. Remove sausage from casing (if necessary) and add to the pan. Crumble sausage and cook through. 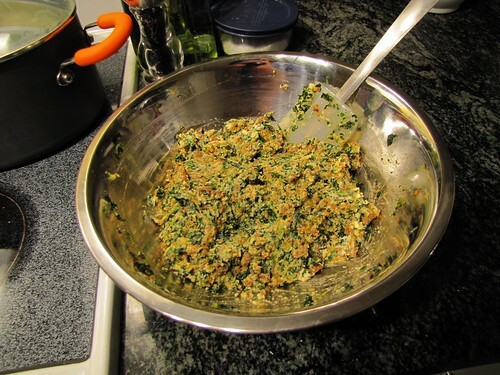 Drain thawed spinach in a sieve or clean kitchen towel thoroughly and add to the sausage. Add in the remaining diced garlic and some grated nutmeg if desired. Saute for two more minutes, and remove from pan. Allow to cool slightly, then stir in ricotta cheese and set aside. Set a pan of water to boil for the manicotti. Add a good pinch of salt to the water and cook pasta according to package directions. Drain, and drizzle with a little oil to keep noodles from sticking to each other. Allow to cool slightly before handling. Spray a 13 x 9 x 2 casserole dish with non-stick cooking spray, and layer in half the sauce. 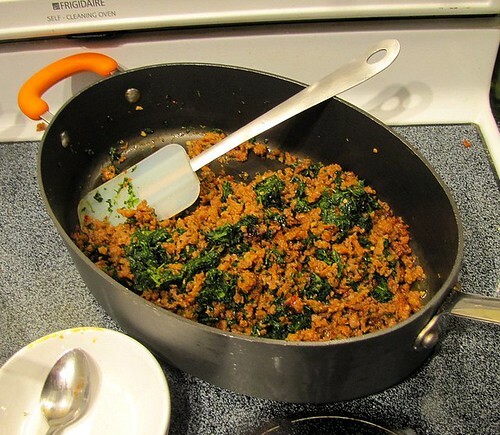 Spoon the sausage and spinach mixture into a large zip top baggie and snip off one corner. 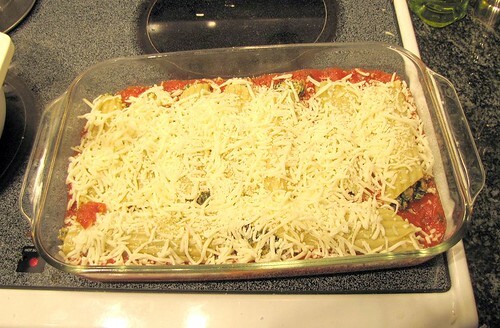 Squeeze some of the mixture into the opening of the manicotti noodle at each end, taking care to not over fill. Note: I did not take a picture of this step because I only have two hands, so, you know, visualize, people. Lay noodle in sauce & repeat until all filling is used. 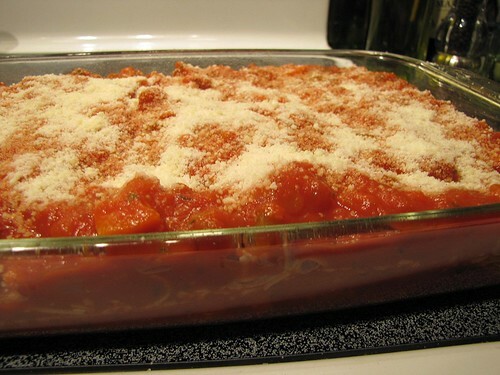 Top with shredded mozzarella, remaining sauce, and grated parmesan. Cover with foil and bake at 375 degrees for 20 minutes. Remove foil and bake an additional 10 minutes. 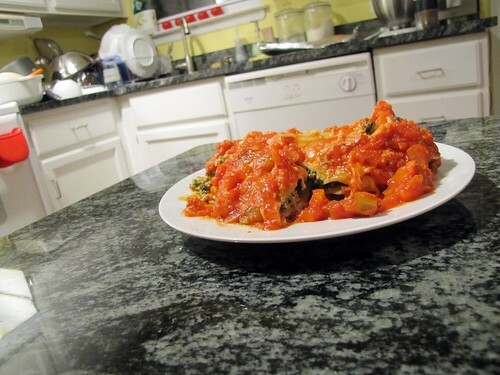 Smack yourself in the head for attempting to make this on a weeknight and serve. My sauce was a little chunky, so if you’re so inclined, you could run an immersion blender through it or something to smooth it out — especially if you’re serving kids, so they don’t see the veggies. Please don’t mind the dishes drying in the background on the last photo. I kind of liked the wonky angle and was too lazy to crop them out. Delish! Can't wait to try it. Set an extra plate for me next time, thanks.